Cold winter weather can take its toll on our homes, cars, and bodies. Frozen pipes, dead car batteries, and bodily injuries, are common and often require us to seek help from a professional. 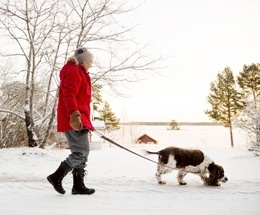 As we age, cold weather can be extremely dangerous. Plummeting temperatures can lead to, icy sidewalks, hypothermia and other serious injuries. If you have elderly neighbors, friends, or relatives, check in with them this winter and share these winter safety tips. 1. Dress in layers. Older adults can lose body heat quickly and be unaware that a change in body temperature is occurring, making them susceptible to hypothermia. Hypothermia occurs when our body temperature gets below 95 degrees Fahrenheit. Consequently, serious health problems can occur, such as a heart attack, kidney problems, or death. Selecting the right number of layers is important. Dressing in multiple layers will help keep them warm and reduce heat loss. To learn more about Hypothermia and symptoms, click here. 2. Keep the furnace running. Experts recommend keeping the indoor temperature around 68 degrees Fahrenheit at a minimum. While many elderly people live on a budget, it’s important to keep their homes warm. Consider helping with some small home projects to keep heating bills down. Such projects may include closing vents, putting plastic on windows, or placing rolled towels or blankets in front of doors to reduce drafts. In addition, if they’re using a fireplace to heat their home, make sure they have the glass closed or a large screen to prevent sparks from landing on their flooring. Lastly, make sure they have working smoke and carbon monoxide detectors on each floor of their home. 4. Prevent broken hips. Broken hips are a common injury for the elderly, but can lead to other health complications. To prevent injuries, shoes with non-skid soles should be worn. 5. Keep their pantry and medicine cabinet full. If a winter storm is approaching, make sure they have plenty of food and water to last for five to seven days. 6. Use smart technology. With today’s smart technology, we can keep better watch over our homes and loved ones. Technology companies, such as HoneyCo makes it easy to turn an aging parent’s home into a smart home. Voice activated personal assistants like Siri, Alexa, and Cortana can help. 8. Discuss severe weather. When the deep freeze is about to settle in or a blizzard is going to strike, make sure they understand. Let them know when the weather event will occur and how long it will last.